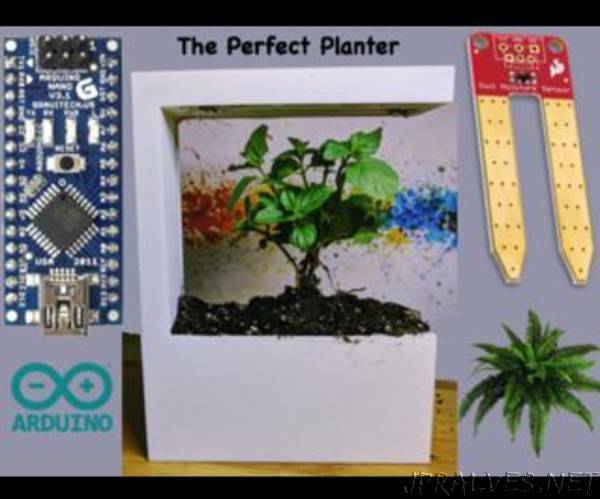 “This planter is probably one of the smartest planters you have ever seen. All in it’s sleek and modern design, this planter boasts a soil sensor that detects when your soil is dry. When it is dry, a peristaltic pump turns on and automatically waters your plants for any amount that you like. Now, that is not all. On the top and the side, there is a grow light that will be on as long as the planter is plugged into an outlet. The plug is a dc barrel jack and this project includes the specific cable. The specific cable will be mentioned later. The whole entire project was designed in Tinkercad. And, this whole project is $55. Reason: Requires a lot of materials that not a lot of people have that don’t have a link to buy in the parts step, such as silicone sealer, plastics bonder, and a drill with small bits. Also, It requires printed parts with different materials and an intermediate sense of soldering.